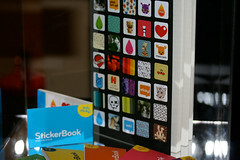 Last night I went up to Exmouth Market in London for the launch of the new StickerBooks by Moo. An excellent party. I think it was Suw who commented that they promised us a “hot and sticky” party, and given the weather yesterday, that’s what we got. The venue was adorned with various Moo products. I like the look of my own Moo cards, but I’m continually astounded by the quality of the cards that other people come up with. There were enough people there that they ran out of name stickers, and for the crowd to spill out into the street and nearly block Exmouth Market. I hadn’t been to that particular part of London before – it seems like a nice area. As for the Moo Stickers themselves – very nice. I’d already ordered my own first set before the party, but I hadn’t seen the finished product. I picked up a free book last night. They are the usual high quality product that we’ve come to expect from Moo, although a bit fiddly to peel out of the book. The books themselves contain space for stickers from your friends, and have some lovely touches (all I’m going to say here is: you ain’t seen me, right?). I think they are going to be great for general decoration, sharing my photos with others, and giving to my nieces and nephews. The size of the stickers is also likely to encourage me to take more close-up shots. I’ve been adorning my own items with a few stickers already. LaughingSquid also has a review of the StickerBooks. 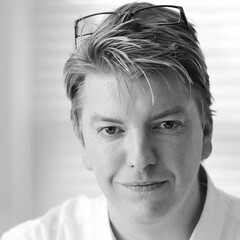 On a related note – the first real signs of possible competition to Moo have appeared with the new PhotoBox MyCard. These are normal size / standard form factor business cards, but the trick they do have is that they can be double-sided, with a collage of photos on one side. On the negative side, the range of designs is a bit limited, their site is not hugely usable, and they do not pull images from Flickr or other websites… given the quality of the product, ease-of-use of the site and niceness of the people, I have to say that that my loyalty to Moo is strong, especially after events like last night, so I think PhotoBox may have an uphill struggle. 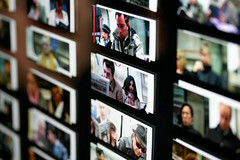 Check out the set of shots I took last night over on Flickr. And then go and order your stickers. You’ll be their new best friend. Here’s the official write-up on the Moo blog. 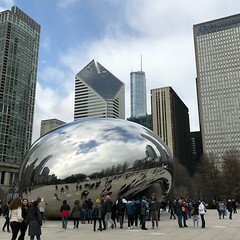 They used one of my photos. Yay! A much-reduced Team Supernova was at SLUK 07 this weekend and managed to get SLorpedo finished off – complete with torpedos, explosions, and sinking subs. Check out the YouTube video. Well done to Jim, Nigel, Paul and James. “Have some of these, Andy”, said Roo, passing me a silvery packet of cards. And thus began my current frustration – Perplex City. Roo, you see, is secretly evil. Perplex City is essentially a series of collectable puzzle cards of increasing difficulty, all tied in with a website where you can register and enter the answers, scoring points for each card you solve. There’s also much more to it than that. 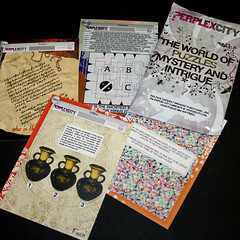 Perplex City is – or rather, has been until very recent cancellation – also an Alternate Reality Game, where the puzzles and the stories told on the backs of the cards, combine with real-world clues and other media to act as an interactive game. 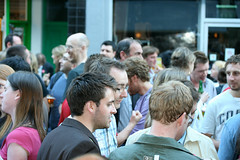 Fellow eightbar writers Ian, Roo and Nick have all blogged about it before. I’m late into it, and I’ve never played ARGs before… so I can’t claim to really “get it”. Unfortunately, on the very day that Roo handed me those cards, Mind Candy (the makers) announced that the current “Season 2” of the Perpex City ARG had been cancelled, although the cards will continue to come out. Still, I’m left with a stack of, well, far too many cryptic Perplex City Season 2 cards, to tease my poor brain. Maybe the ARG part would have blown my mind completely. One of the things I love about using social networking technologies is the ability to extend my real life, physical networks. That’s what it is all about. 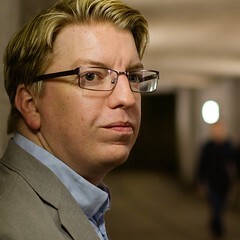 Thanks to the magic of Dopplr, I found out that Richard Brown was due to be in Edinburgh last night, and we had a long-overdue chat over dinner (but I think I failed to interest him in Twitter). Not only that, looks like Leisa might be in town next week – so far only an online acquaintance. James asked me to pass on a Dopplr invite to Werner Ramaeker. Turns out that Werner was amongst a group of people I presented to in Hursley last year. Going further back, before the last Minibar, I learned that mattb was going full-time at Dopplr (via Twitter), and then met him at the event a couple of hours later. There are lots of other examples, these are the recent ones. I love this stuff! The awesome MOO have moved on from their wildly successful Minicards to produce Notecards – 10cm square cards which you can post, and which stand up with a little folding flap to one side. I just ordered my first pack, and at the same time ordered my 3rd box of Minicards – not quite in time for my trip to Las Vegas next week, which is a shame – think I’ll run out during the week, I only have about 20 left from the current batch. The very easy-to-use interface has seen some interesting tweaks, too. You can now choose your buddy icon, no icon, or a range of icons with flashes like “invitation”, “new baby”, the Creative Commons logo etc., on both the Notecards and the Minicards. You can also have MOO fill in photo details from Flickr (title, date etc.) instead of just putting freeform text on the cards, and they have a tiny URL system so that people can find your images online with minimal fuss. I like it. They know how to win my continuing custom.